The wondrous wizards are back for Funko Harry Potter Mystery Minis Series 2. The second offering brings a few new additions, along with familiar characters for fans and collectors of the Harry Potter theatrical franchise. Like the first edition of Harry Pottery Mystery Minis, the best friend trio of Harry, Hermione and Ron are miniaturized, only this time around they are each wearing the Sorting Hat. Also among the main set are multiple pets and creatures, including a Dementor, Grindylow, Pigwidgeon, Pixie, and a Thestral. Shop for Harry Potter Mystery Minis on Amazon. Although a few are newcomers as minis, several can be found in the Pop! Harry Potter line, including Barnes and Noble-exclusives Neville Longbottom and his pet toad, Trevor. 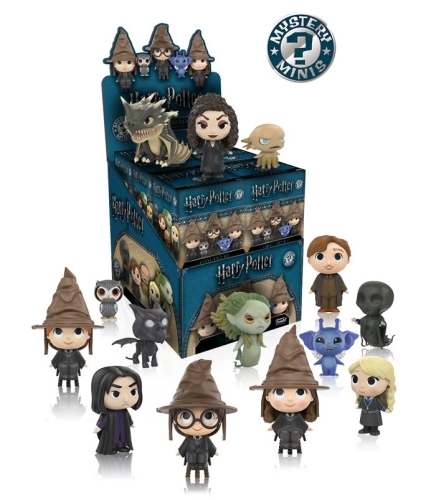 Additional retail-specific figures, such as Sirius in Azkaban prison attire (Hot Topic), bring the total number to a whopping 22 Funko Harry Potter Mystery Minis Series 2 figures to locate. Because each figure is issued in the established blind-box format with every case holding just a dozen boxes, collectors will not only need more than one case, but also must visit at least two other outlets to complete the set. Individual known odds are noted below. Exclusive figures for Barnes & Noble and Hot Topic are noted below. View more Harry Potter options with our related Funko guides. Wow! Great news! Have been waiting for wave 2 like forever! Thanks for posting this! Need to find source for hot topic and Barnes and Noble sets :)! HARRY POTTER FUNKO MYSTERY MINI CASE NEW! 12 BOXES!